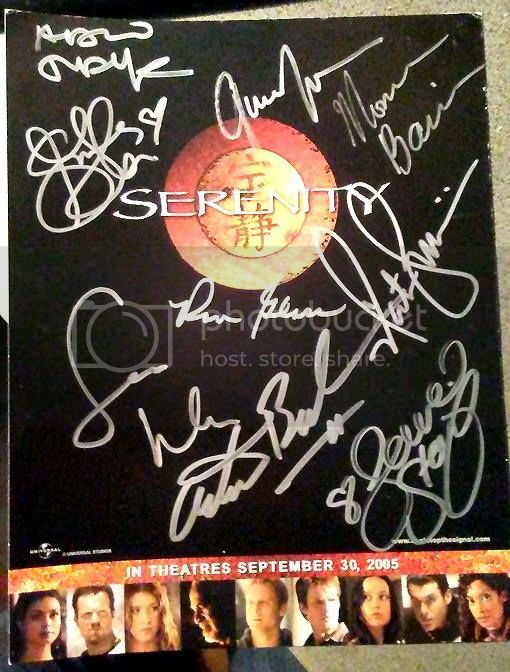 I have this Serenity lobby card for sale, signed by the entire cast, and I'm wondering if anyone here is interested in it. Please note: It is NOT in mint condition - there is wear along the edges and at the corners. But the signatures are authentic, acquired only by me and in person with each actor. It was signed at various Dragon*Cons and Fan Expo Canadas, except for Ron Glass, who signed it at Polaris, a now-defunct general sci-fi convention in Toronto, ON. The last signature was Nathan's, at Fan Expo Canada in Toronto in 2014. If you are interested, please message me here. I have an idea of what I'd like for it but I'd rather hear from interested parties first. Thanks. I have other Firefly items too, if people are looking for things. Please let me know if you are.